Last month saw our Jetstar Flying Start panel convene again to (somehow!) choose between this quarter’s 160 amazing applicants. I LOVE being part of this team – hearing about the incredible community initiatives happening all over New Zealand is nothing short of inspiring, plus, we get to award one applicant a Jetstar Flying Start Grant of $15,000 cash and $15,000 worth of travel! The four other judges and I were all drawn to one application in particular during this round of judging – that of high school anti-bullying group, Sticks ‘n Stones. A bullying culture is becoming more and more prevalent in New Zealand, both online and in real-world situations. Sticks ‘n Stones are a student run organisation based in Otago that sees action groups from 5 secondary schools in the region meet fortnightly to further their targeted response to bullying in their respective schools and online. I loved this application. These guys are incredibly organised, focused and have a clear vision of where the group is going and how they’re going to get there. I asked Emily Boud (17, from Alexandra) some questions about Sticks ‘n Stones and how they are going to move forward with championing the power of positive action online and in schools. Was Sticks ’n Stones formed to combat existing bullying culture within your school or to preempt it gaining traction? I think there is a bullying culture anywhere you go. Especially with cyber bullying. These days it doesn’t have to be someone from your school. 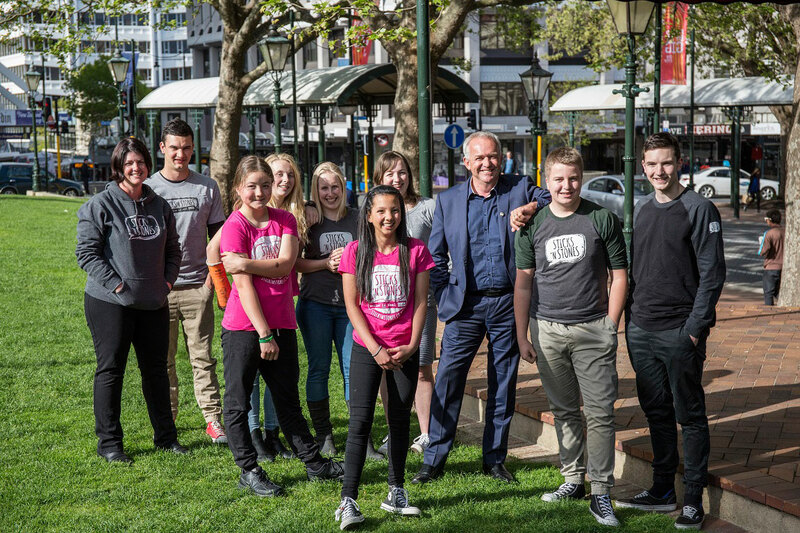 Sticks ‘n Stones was formed to combat an existing bullying culture overall, focusing initially in Central Otago schools. However, we also started to help pre-empt cyberbullying gaining traction and to stand up against how ‘normal’ it was for hate to be shared online and to challenge people to consider the impact of their words and actions BEFORE they post or comment. How is bullying dealt with by kids who have worked through the Sticks ’n Stones programme? Sticks ‘n Stones provides informal support for victims and identifies all the options and support that the victim has available to deal with bullying. Some of us in the group have been bullied before so we can also share our experiences. However, we don’t know the definite answers of what to do as we are not experts and every situation is unique but we can help to connect the dots for parents or young people who are feeling overwhelmed or vulnerable. Bullying is also dealt by encouraging people to recognise the bullying online and to step up and say something to the bully or to check in with the victim and make sure they’re alright. By doing this, we are influencing others online and offline to take action and be positive. One of our big goals is for the culture that exists that accepts bullying as ‘normal’ or ‘part of growing up’ to be challenged and by being that voice ourselves, we can create a positive change within our peers for young people to lead the way as role models. What are three tips you could give to a family dealing with bullying at school or online? The top tip would be listen to your child! Make sure you hear them out. By doing this you aren’t jumping to conclusions and you aren’t going to upset them even more by your actions, even if you have their best interest at heart, this can often make things worse. Another top tip would be to look at ALL your options. Running straight to the school principal may not always be the best option. However, in some cases it might be. Talk with your child about the steps they would like to take and make a plan with them. If you do not get the support you need from your initial meeting then talk to someone else. This might be a Dean, Guidance Counsellor, Deputy Principal, Youth Worker or even the local Health Nurse or Police Youth Officer. The third top tip I recommend is to be there for each other. Create a culture within your family to share everything, even when they might be embarrassing or hurtful. Love and care for each other and show that you value them and their points of view. Reinforce with them that they are not at fault and that they do not deserve to be made to feel this way. Recognise warning signs that may suggest they are going downhill. Talk to them about this. However, it is also important to also give them space if they ask for it. How did you team react when you found out you were the successful recipients? We were very excited and thrilled. We knew there were some amazing groups that had applied in the past and to be alongside them is really wonderful. We could not believe that we had been fortunate enough to be win the grant and there was a a few tears and screams when the news was first shared. We are all very much looking forward to what the future holds and know this grant will really help us to take our next steps. Are there plans to expand Sticks ’n Stones to other schools? There absolutely is. We are just in the middle of working out school action plans and are editing a documentary as we speak about our group and how it could be set up in other schools. Some of our members are moving on to uni next year and we plan for then to act as mentors with School Action groups in Dunedin, Christchurch and hopefully Wellington. We are also building partnerships to support us to take our next steps and would love to talk to anyone interested in helping us with our expansion. What does the grant mean for the future of Sticks ’n Stones? The grant takes us closer to our goal of an independent student led group that provides opportunities across the country. It gives us the opportunity to have our young people representing us at an international conference and gaining ideas and support from other groups working to stop bullying. It also helps us to take our idea of an interactive board game that will stimulate discussion and challenge perceptions around bullying to move forward to the next step. These are key steps for us to provide a platform for other young people to have their voices heard and valued. Jetstar have given us an incredible opportunity to continue our growth and we are excited about where this could lead. Sticks ‘n Stones you are amazing, I’m so excited that my boys are going to head to high school in years to come with positivity advocates like your group members there to support them. Congratulations!